Rory Stewart MP visited the village of Warcop on Friday to look at the damage caused by the recent floods. 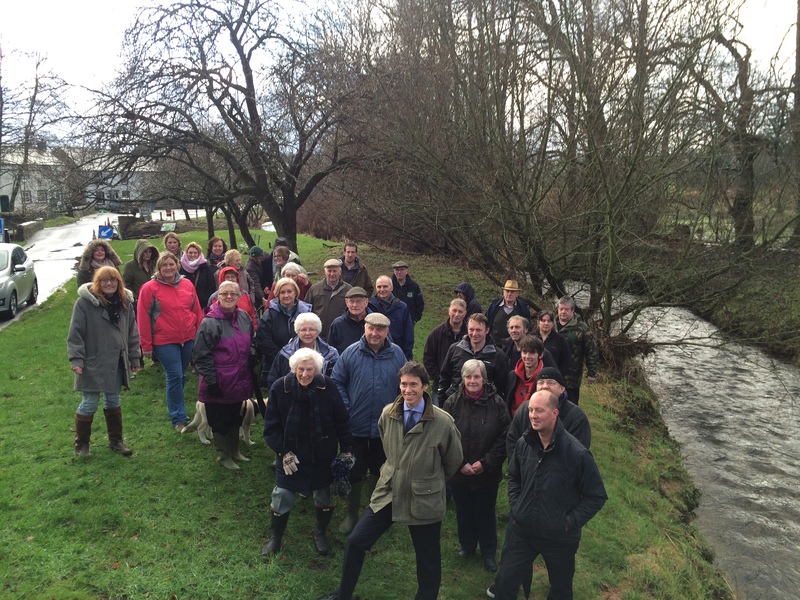 Residents gathered to meet Rory as he walked through the village, looking at the river and its banks and discussing how to protect the village better in the future. The visit was one of the first stages of the new Cumbria Floods partnership, chaired by Rory Stewart. The Floods Partnership will be conducting visits to communities across the county, on a daily basis, to listen to residents, take on board community ideas on better flood protection, and provide advice and support. There are currently 19 sessions planned in different communities over the next 15 days, in which the Environment Agency and Local Council staff will be available to meet residents. Following the first round of community meetings, the new Cumbrian Floods Partnership group, chaired by Rory, will then consider what improvements to flood defences in the region are needed. A designated officer will be appointed for each major catchment as the key community link. They will develop plans all the way from upstream options for slowing key rivers to reduce the intensity of water flows at peak times, to “hard” defences around towns. Rory has also taken on the role of the Prime-Minister’s Floods Envoy for Cumbria and Lancashire, coordinating the national component of the flood recovery operation, in support of Cumbria County Council. This work will be supplemented by a National Flood Resilience Review to better protect the country from future flooding increasingly extreme weather. In light of the Cumbria events, a new cross-Government team will look afresh at how risk is calculated. This will see the Government updating ‘worst case scenario’ planning, considering the future impacts of climate change and carrying out a risk assessment of critical infrastructure, like electricity substations. The review, also to be published next summer, will be led by the Chancellor of the Duchy of Lancaster Oliver Letwin and include the Government’s Chief Scientist, Defra, DECC, DCLG, HMT and the Chief Executive of the Environment Agency.